$499 DOWN Guaranteed Approval!!! Start enjoying more time in your new ride and less time at the gas station with this 2015 Hyundai Sonata. Beautiful exterior. Clean interior. This Hyundai Sonata is so immaculate it is practically new. 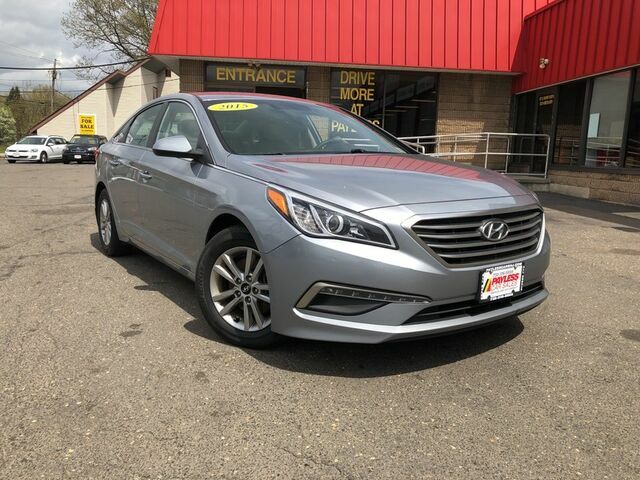 The quintessential Hyundai -- This Hyundai Sonata 2.4L SE speaks volumes about its owner, about uncompromising individuality, a passion for driving and standards far above the ordinary. More information about the 2015 Hyundai Sonata: The 2015 Sonata is a midsized sedan, placing it in direct competition with several of the best selling cars in the country. Competing with the likes of the Toyota Camry and the Honda Accord is no easy task, but Hyundai's typical strategy of packing a ton of value into their cars remains unchanged. The Sonata offers a lot of car for the money, undercutting its rivals in price, while simultaneously offering more interior volume and more upscale features. The 2015 Hyundai Sonata starts at $21,150. This model sets itself apart with inexpensive base price, available upscale features, roomy interior, Swoopy styling lines, and efficient engines Call now (732) 316-5555 This one won't last! Whether you have good credit, bad credit, no credit or even in a bankruptcy or repossession we can help. Our goal is 100% guaranteed approval!! Call us at 732-316-5555 or come on in to our South Amboy, New Jersey showroom and one of our credit specialists will help you get the vehicle you deserve at a payment you can afford. The advertised price does not include sales tax, title, DMV fees, finance charges, prep fee and documentation charge of $389. All financing subject to lender approval, rates and terms may vary. Any payments listed are an example and not an offer or guarantee or terms and are subject to lender assessment of credit,down payment and term. Prices subject to change at any time. While every reasonable effort is made to ensure the accuracy of this information, we are not responsible for any errors or omissions contained on these pages. Please verify any information in question with your sales representative.